Do you know of someone who does strange things with electricity? Are you yourself a strange electric thing? Please come and tell us about it, either drop us an email or come along to one of our monthly workshops (rubber gloves provided). Dorkbot ALBA are dorkbot group based in Edinburgh. 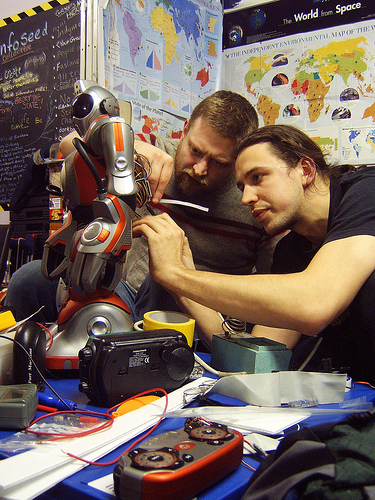 Each dorkbot is different and is driven by the needs and interests of people in the local community. But generally, the main goals of dorkbot are: to create an informal, friendly environment in which people can talk about the work they're doing and to foster discussion about that work; to help bring together people from different backgrounds who are interested in similar things; to give us all an opportunity to see the strange things our neighbors are doing with electricity. dorkbot isn't really a forum for formal artist talks or lectures, but rather a chance for diverse people to have friendly conversations about interesting ideas.